The one born of great darkness. . . she is the black fire that will reduce all to ashes, the dark power that dances in madness inside the storm of chaos. After the fire dies, the rich soil will be resurrected. The earth shall once again overflow with abundance and joy. Name Etymology: "Ordine" (Italian), meaning "order." • End of the World: Fires a jet-black wave from her mouth that destroys all data. • Magna Visibility: An omnidirectional attack in which she launches the two orbs embedded in her wings to attack the enemies around her. • Summon Apocalypse: Her falling feathers transform into countless Digimon and attack. The truth about her is still unclear, but a portion of researchers theorize that she appears when the Digital World has been plunged into chaos and is meeting its end. 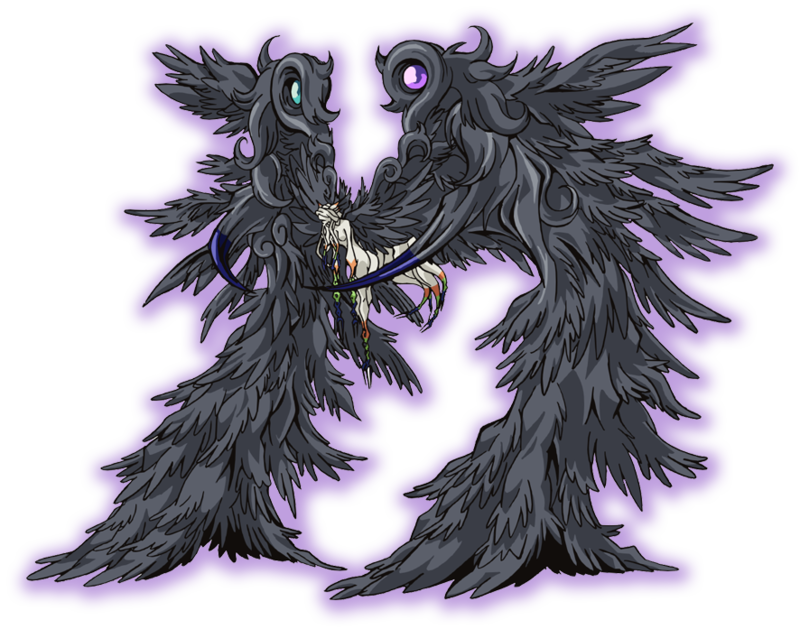 Negative emotions themselves flow out of Ordinemon's wings, and a flap of her wings will spread miasma throughout her surroundings. The endlessly overflowing miasma is capable of eventually covering the entire world, resulting in the end of all life. However, her true nature is one of kindness, a high-standing being who plans to save the world by first returning the world, which has lost its order, to nothingness. Once upon a time, there was a big nakey fallen angel and she broke everything. The end.